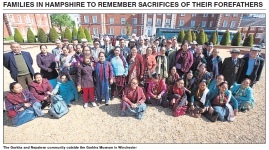 25 May – Daily Echo newspaper article – Retired Gurkhas honour the lost lives of soldiers. Click the photo to open / download the article (PDF, opens in new tab). 23 May – The annual day-out to the Gurkha Museum in Winchester and Sir Harold Hillier Gardens in Romsey in this year, the 200th anniversary of the Gurkhas first enlisting in the service of the British Army. Click the photo to open / download the visit description (PDF, opens in new tab). 13 August – Isle of Wight visit. Click the photo to open / download a PDF of the visit (opens in new tab). 24 May – The annual day-out to the Gurkha Museum in Winchester and Sir Harold Hillier Gardens in Romsey. Click the photo to open / download the visit description (PDF, opens in new tab). 7th December – Maddhat Shamuha was awarded the Queen’s Golden Jubilee Award for voluntary service in the community in 2012. Click the logo to open / download a description of the award ceremony (PDF, opens in new tab). 9th May – Dana Village description (in Nepali). Click the photo to open / download the village description (PDF, opens in new tab). 10th June – Visit from Mayor and the Choosewell NHS project. Click the photo to open / download a photo gallery of the visit (PDF, opens in new tab).